"This is one of those great recipes that my Grandma's buddies used to make at our church functions, and that we always looked forward to." Lightly grease a ring mold or 9x9-inch square pan. Drain the mandarin oranges and reserve juice. Add cold water to the juice, if necessary, to make 1 cup of liquid. In a mixing bowl, combine the boiling water and 1 cup mandarin orange liquid. Dissolve gelatin in this mixture, and refrigerate until it begins to set. Using an electric mixer, beat in sour cream and softened sherbet at medium speed until fluffy and well-blended. Gently stir in mandarin oranges and pineapple chunks. Pour mixture into ring mold or prepared pan and chill overnight. Didn't really gel up like it seems like it's supposed to. Very good. It has an unusual taste with the sour cream, but we really liked it. I have made it several times for different functions and always get praises for it!!! This has been a huge hit both times I served it. I've made with and without the pineapple chunks. Absolutely delicious and very refreshing for spring/summer. Thanks, Susan! This has great flavor but mine did not gel properly either! I made it for a shower I am giving tomorrow so I will have to figure out something else now. Not sure what went wrong...disappointed! Very good! 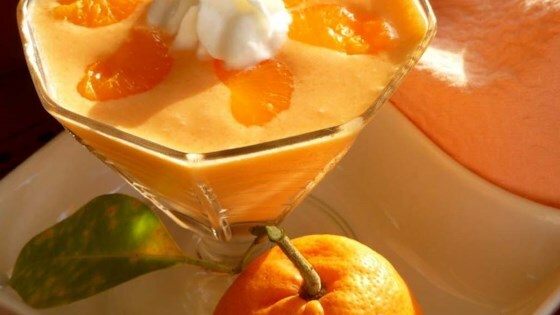 Nice cool and refreshing dessert for warm weather. I did use yogurt instead of sour cream. Topped with whipped cream. Yum! I'll be making this again. This was so yummy! I left out the pineapple and used 8 oz of Cool Whip instead of sour cream. My grandkids couldn't get enough.